Let me help you, like I have helped other therapists. Watch this recording and learn new innovative interventions to help even your most resistant clients become unstuck. Your day will consist of creative, interactive, hands-on training that will re-energize your work. You will leave with 77 fresh new art strategies and approaches that you can use immediately to engage even your most difficult and challenging clients. Develop a plan for introducing art into clinical practice for treatment resistant and challenging children and families. Laura Dessauer, Ed.D., ATR-BC, is a board-certified art therapist with a doctoral degree in counseling psychology. She has worked with families for 25+ years in over 21 school districts. Dr. Dessauer is passionate about helping families develop creative ways to confidently communicate and creatively connect. 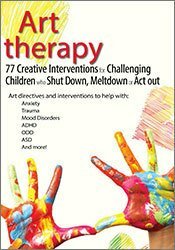 In her private practice, she specializes in working with children who shutdown, meltdown and act out. She playfully blends cognitive behavioral skills, art-making, and creative problem solving to help clients create individualized social, emotional, and behavior interventions that “stick to their brain”. Dr. Dessauer’s work has been included in Parent’s Magazine, eHow Parenting, YourTango, Fox News, PBS “This Emotional Life”, Lifetime Network, Working Mother, and Psychology Today. Dr. Dessauer is contributing author of “Healing with Art and Soul: Engaging One’s Self Through Art Modalities” (Cambridge Scholars, 2009). She has presented at the Eighteenth Annual National Expressive Therapy Conference, National American Art Therapy Association 40th Anniversary Conference, and American Art Therapy Association Institute for Creative Education in Art Therapy (ICE/AT), and has created international online training courses for therapists. Dr. Dessauer has created a relaxation CD, ”The Creativity Queen’s Superfabulicious Self-Soothing CD”, and therapeutic coloring book, ”The Creativity Queen’s Superfabulicious Colorific Adventure Book” for her clients. Her business, the Creativity Queen, LLC, was the winner of the 2007 Small Business of the Year Award (SCORE). Financial: Laura Dessauer is the founder and director of Creativity Queen, LLC. She receives a royalty from the American Art Therapy Association. She receives a speaking honorarium from PESI, Inc.
Nonfinancial: Laura Dessauer is a member of the American Art Therapy Association and the Florida Art Therapy Association. PESI, Inc. is an AOTA Approved Provider of continuing education. Provider #: 3322. This self-study course qualifies for 6.0 self-study contact hours or .6 CEUs in the Category of Domain of OT and Occupational Therapy Process. The assignment of AOTA CEUs does not imply endorsement of specific course content, products, or clinical procedures by AOTA. Course Level: Intermediate. Expires: 5/17/2020. This self-study activity consists of 6.0 clock hours of continuing education instruction. The following state psychologist boards recognize activities sponsored by PESI, Inc. as an approved ACCME provider: Alaska, Arkansas, California, Colorado, Georgia, Illinois, Indiana, Kentucky, Maine, Maryland, Missouri, Nebraska, Nevada, New Hampshire, New Jersey, New Mexico, Oklahoma, Pennsylvania, South Carolina and Wisconsin. Certificates of attendance will be issued for you to submit to your state licensing board to recognize for continuing education credit. Full attendance is required; no partial credits will be offered for partial attendance. PESI, Inc. is accredited by the Accreditation Council for Continuing Medical Education to provide continuing medical education. PESI, Inc. designates this self-study activity for a maximum of 6.0 AMA PRA Category 1 Credit(s)™.